Certificates & Gift Certificates are a symbolism of a good will gesture toward your valued clients, It Endeavors to develop a personal relation. It also helps to boost your business. The design of a certificate or a gift certificate describes your professional approach. 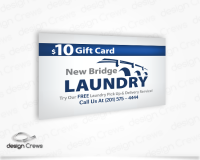 When your gift certificate is designed to match your company logo and brand, it essentially works as a marketing tool in the customer’s pocket. Design Crews Vancouver creating a theme base designed Certificates & Gift Certificates to enhance your customer loyality and reward program.